What Language Does Black Panther Speak in Civil War? In this weekend's Captain America: Civil War, Marvel fans will be introduced to Wakanda native T'challa, a.k.a. Black Panther, a statesman who gets involved in the worldwide effort to create an agency that will watch over The Avengers. The country of Wakanda has been mentioned several times in previous Marvel movies, and in last year's Avengers: Age of Ultron, we even met Wakanda native Ulysses Klaue (Andy Serkis), who is believed to return in the standalone Black Panther movie. 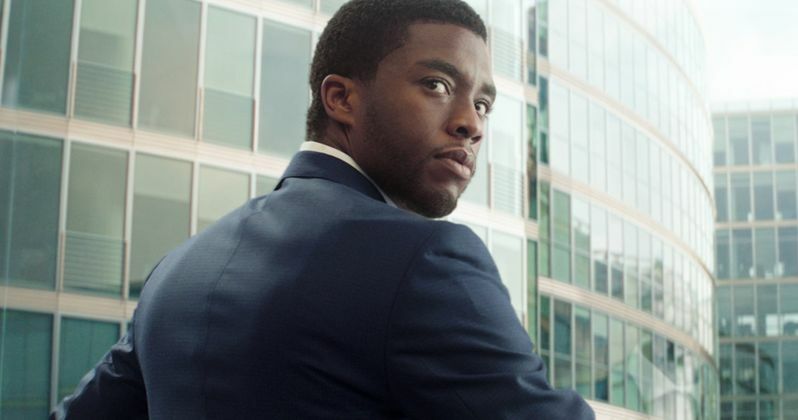 During certain scenes in Captain America: Civil War, T'challa, played by Chadwick Boseman, is seen speaking the Wakandan language with his father, T'chaka. But since the country of Wakanda doesn't actually exist, some fans may be wondering what that language actually is. Thankfully, director Joe Russo revealed exactly what language we hear T'challa and T'chaka speak, in a new interview with Entertainment Weekly. T'challa speaks English throughout most of the movie, but in certain scenes where the father and son are communicating directly with each other, the director found a suitable language for them to speak, dubbed Xhosa. Here's what the filmmaker had to say below. "The language we used for Wakandan is called Xhosa. John Kani, the actor who plays T'Challa's father in the movie, speaks the language and taught it to Chadwick. It's spoken by 7.6 million people in South Africa." While we don't know for certain, it seems likely that we'll be hearing more of the Xhosa/Wakanda language in the standalone Black Panther movie, which is slated for release on February 16, 2018. While no plot details have been given for the movie, it is assumed that the standalone adventure will be set in Wakanda. As of now, no other actors have been attached, but Kevin Feige recently revealed that director Ryan Coogler is currently working on the script, and that production is slated to begin in early 2017. No story details have been released for Black Panther at this time, and it isn't known if any other members of the Avengers will surface in this movie. As for the Xhosa language, one of its more prominent speakers is South African leader Nelson Mandela, who descended from the Thembu tribe of the Xhosa people. We'll be sure to keep you posted with any and all Black Panther updates as soon as we have more information, and be sure to check back on Sunday to find out how Captain America: Civil War fared at the box office.